‘Woef-Out’ is a successful dog walking and pet sitting business based in The Hague, the Netherlands. In this article, I speak with founder/manager Paula Welgraven about a day in the life of a professional dog walker. I met Paula in the woods while working on a Canis bonus’ photo-documentary dog walks. I greeted her with my usual enthusiasm for everything dog-related, and before I knew it, we were chatting away about dog behaviour. I was immediately struck by her relaxed, open, and well-informed attitude. If anyone could proudly represent dog walking in my dog pro hall of fame, Paula had to be the one. Paula gladly accepted to be interviewed, and you are reading transcript of our conversation. Dog walking in The Netherlands is gradually gaining respect as a profession, but many still see it as a job for the unskilled. Given Paula’s education and professional attitude, I was delighted to meet such a good ambassadress to the cause. If only all walkers were equally committed to continuing education and the high standards set by the Dutch Professional Association of Dog Walkers, the field would professionalise itself a lot faster. Laure-Anne – How did Woef-Out start? Paula – I used to work very unusual hours for the flower market, so my sister asked me to let her dog out every day. I figured if I am doing it for one dog, I might as well do it for more. This was 2006. Six months down the line, I was walking about six dogs. As I had always wanted to run my own business, I wasted no time in exchanging my sports coupé for a van, and having my website designed by a professional. I have made a living out of dog walking since. L-A – What other services do you offer? PW – I also offer a pet sitting service for all sorts of pets, not just dogs (reptiles, birds, cats, etc.). This involves my going to people’s homes when they are away, looking after their pet. L-A – What set-up do you have? It’s not just a question of picking up your hiking shoes, is it? PW – There is the branded van, but you also need to think of dog treats, water, blankets, towels, good outdoor clothing with your logo on it, an ID tag for each dog, safe and comfortable transport pens, a first aid kit, etc. You need quite a set-up to fulfil professional standards. L-A – If money and time were not a factor, what would be your dream business expansion? PW – I would love to study physiotherapy for dogs. But it seems you have to have a degree in human physiotherapy first, and I just do not have that sort of time. I would also love to look into canine behaviour therapy. L-A – How old were you when you had your first dog? PW – We have always had dogs in my family, so I have had dogs since birth. L-A – Do you have a dog now? PW –I have young Jack Russell. He comes along on one of the daily walks. PW – It’s not so much dogs as animals in general. I used to be a horse-riding instructor, actually. Oh, and I have two cats. L-A – Is the profession badly affected by the financial crisis? Are the services perceived as a luxury for times of plenty? PW – I am definitely getting less enquiries, but it does not affect me directly as I am close to capacity anyway. L-A – With such a physical profession, what do you do when you are ill? PW – Actually, in the four years that I have been doing this, I have not once been sick! But it states in the contract that I have no official replacement solution should I be unable to walk one day. L-A – How old is the profession here in The Netherlands? In the UK and US, it’s getting reasonably settled. It started to pick up pace around 25 years ago. 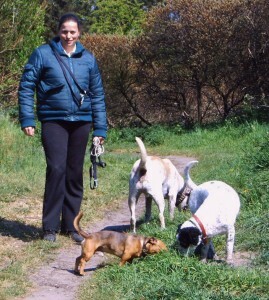 PW – Professional dog walking has been around in The Netherlands for ten to fifteen years. L-A – How many walks do you do per week? PW – I do two walks a day, five days a week. I also regularly walk two boerboels separately as they are getting too old to walk with the group. L-A – Describe a typical day. 8.30am: I leave the house to start the first pick-up round. 10am: The morning walk starts. 11am: I clean up the dogs a little, and load them in the van to start the drop-off round. 1.30pm: The afternoon walk starts. 2.30pm: Again, I tidy up the dogs a little, and then start the drop-off round. Around 4pm: I return home. There are often delays, of course. Some dogs take their sweet time getting back in the van. L-A – What are the perks of the job? PW – Hiking had always been a hobby of mine, and I am definitely the outdoorsy type, so spending so much time walking outside is a big perk for me. I also love the freedom: even if you are running ten minutes late, it’s not like the dogs are there waiting for you, looking at their wristwatch. The biggest kick of all has to be watching them have a blast, frolicking about with each other. I often play games with the dogs, like this one: I make them form a circle around me and we play ‘Simon Says’ for a treat. Sometimes, I place a treat on the van’s bumper, and they have to take it in turns to get it. They love it. It’s like kindergarten sometimes. Because it’s not just one dog, I avoid playing games that could cause competition, like a playing with a ball. L-A – What are the worst aspects of the job? PW – The driving… I spend about twice as much time driving as I do walking. It’s not straight, efficient driving either: you have to constantly get in and out of the van. L-A – How do you feel on a rainy day? Are you really never tempted to cancel your dog walks? PW – I actually really love walking in the rain: there is nobody else around so the walks are really quiet and relaxing. I have good rainproof clothing, so I don’t mind weather so much. Of course, when it rains, the dogs and the van need cleaning way more often. L-A – How varied are the routes you walk? PW – There is more choice in the winter, like beaches, as a lot of places are off-limits for off leash dogs in the high season. All in all, I have about six different routes to choose from within a practical range of my customer base. L-A –Does the composition of the group groups you walk vary much? PW – So far, I have kept nearly 100% of my customers, so the groups are quite stable. This allowed me to compose the groups optimally in terms of individual temperaments, as I can switch a dog between morning and afternoon walk if he fits better with the other group. L-A – What personal qualities would you advice to be successful in the dog walking business? PW – You need to love dogs, obviously. You also need to have sales skills, as you have to be able to confidently defend the profession to sceptics. L-A – Do some people react negatively to you when you are walking the dogs? PW – I get the occasional ‘Why do people take a dog if they can’t even look after it?’. I believe in what I do and the dogs are clearly benefiting, so I can explain the benefits of professional dog walking to these people. L-A – If you were a dog, I presume you’d be happy to have you as a dog walker. What makes your services special? PW – I go beyond the regulations when it comes to comfort and safety. My van has air conditioning and roof ventilation, for example. On hot days, I also lay fresh wet blankets on the floor. In the winter, I have warm comfortable blankets for them. The transport pens in which I carry them are custom-made by a professional carpenter. 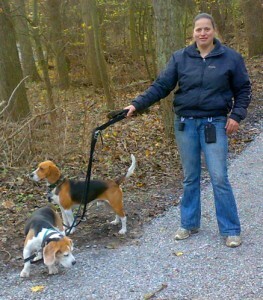 L-A – How important is cooperation with other local dog walkers? Is it a very competitive business, or is it rather cooperative? PW – As a rule, I do not know that there is so much cooperation, but I definitely have very good contacts with another dog walker in the region. We refer customers to each other, for example. L-A – What is the proportion of dog walkers that are member of a professional body in The Netherlands? How many professional bodies are there? The van must be disinfected at least 1x per week. As dog walking is becoming a popular profession, it is important to professionalise it to avoid abuses which will affect our reputation. L-A – How far are we from well-recognized standards ruling the profession? PW – Only a minority of dog walkers are members of HUS. L-A – What are the extreme examples of unprofessional behaviours from those non-syndicated colleagues? PW – You occasionally hear stories of dogs left behind, or the walker not bothering to help a dog out of the water. But just go to the dog walking service start page to see the explosion of dog walkers in The Netherlands, some are definitely more professional than others. L-A – How do you keep up-to-date with the latest developments in dog behaviour and health and safety? PW – I receive a newsletter from the Martin Gaus institute. I also read dog books and magazines and check the internet to look up any question I might have. I am an avid self-learner. L-A – What qualifications did you get to help you in your job? I am quite curious about my next one: ‘bewegingsleer’. I think it will be about canine body language. L-A – What is the maximum number of dogs you can walk at the same time by law? PW – There is no maximum number by government law, but the HUS standard is set at 10 dogs. L-A – Do dogs in your care frequently run away? PW – It has only happened to me a couple of times. Once, one of the dogs refused to get out of a bunker on the dunes. He hadn’t run away, but he just would not come out. Another time, one of the dogs just ran back home. Neither dog was hurt, though. But this eventuality is why it is so important to have clearly marked tags on each dog’s collar. L-A – Do dogs in your care frequently cause damage to a third party? PW – Well, aside from the odd burst footballs, I really can’t think of anything, no. L-A – Are insurance rates crippling? PW – Actually, I regularly check and, as far as I know, there is no special insurance for dog walkers in the Netherlands yet. It is all covered by the liability insurance of each individual dog’s owner. L-A – Do dogs in your care frequently fight with each other? PW – They hardly ever fight. If I see that a dog does not get on with the rest of the group, I either take him on the other daily walk, or I refer him to another walker. I sometimes get other dogs showing aggression towards dogs in my group. The group sticks together, then, but I have never had a severe incident. L-A – What are the health and safety regulations in place in The Netherlands concerning the dog walking business? PW – There are no government regulations applying specifically to the profession. Of course you have to abide to general safety regulations in transporting and walking them. L-A – Have you ever gotten injured by a dog while carrying out your job? L-A – Would you ever refuse to walk a particular dog? One time, the dog was absolutely petrified of the van and just refused to get on. Another customer of mine kept cancelling appointments and delaying payment. Right now, I also do not have the transport facilities for giant breeds like St Bernards. Paula followed her dream and built a serious, solid, modern business. But to maintain her business, Paula keeps investing in continuing education and equipment. Here’s hoping that more and more dog walkers will match Paula’s standards, as the profession gradually transforms from a “McJob” (to quote Douglas Coupland), to a respected career in the eyes of the public. You are using a dog walking service. What country are you in and what’s your feedback on the quality of service? You have had a good or bad experience with a dog walking service (please indicate your country). You are a professional dog walker (please indicate your country) and you’d like to comment/add on what was discussed because you agree or disagree with Paula’s views. You are a professional dog walker and would like to comment about the degree of maturity of the dog walking market and profession in your country. You are a dog walker and feel like the profession is still undervalued, or on the contrary, in your country. Thinking of getting a dog? Reality check. This entry was posted in Dog pros: a day in the life and tagged 'dog walk', chien, den haag, dog, dog sitter, dog walker, dog walking, hond, hond uitlaten, honduitlaatservice, la haye, professional dog walker, the hague, westland. Bookmark the permalink. Post a comment or leave a trackback: Trackback URL. Noticed how she started out letting dogs go out in the morning. Not sure if she was paid for this or not, but I think that is a great idea to get started. Offer a small service which can go further? Hmmm. Lots of ideas. At the start, she did her sister’s dog, and then got paid for the others immediately. Nice, hey? cute photo’s of the dogs! Is play-fighting with your dog OK?